Did you know up to 40% of your home’s heating and cooling can be lost through your windows and doors? With Calgary’s harsh winters, properly maintained windows are an important factor in keeping your home comfortable and energy efficient. Developing a yearly weatherproofing and maintenance routine will ensure your windows are winter-ready, so you can feel confident knowing that you will keep your family warm and save money this winter. Increased property value — if you are looking to sell your home, well maintained windows are a great selling point! Keep your house comfortable — weatherproofing your windows will help to keep a uniform temperature throughout your home. No more cold spots by the windows! Protect yourself from costly repairs — poorly insulated windows can lead to other, more expensive incidents such as frozen pipes, leaks, and more. Weatherproofing your windows is a simple way to have some peace of mind. The first thing you’ll want to do when weatherproofing your windows is check the outside of your home for any gaps or cracks around the window frame. If you do notice any gaps, make sure to call a professional to get it repaired. Check the caulking on all your windows and doors to look for wear and tear. Areas that are exposed to extreme weather or sunlight will need re-caulking more often. Re-caulking your windows will greatly reduce the risk of potential drafts or leaks. Apply caulk to all joints of the frame where it meets the wall. Apply during a dry, warm day to ensure the caulk sets properly. 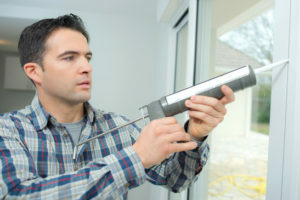 Similar to the exterior check, you’ll also want to check the interior of the window frame to locate any cracks or gaps. Tip: if you suspect your window has a draft, grab a piece of tissue paper or toilet paper and hold it close to (but not touching) the window frame. If the paper moves, you’ve found your draft! Again, if you notice any cracks in your window frame, make sure to call a professional to get it fixed! Even though we are still enjoying the warmer weather, it’s never too early to start thinking of the winter season ahead. Weatherproofing your windows this winter will help ensure that you can keep your family warm without breaking the bank! Marcotte Glass knows windows — if you have any questions about weatherproofing your windows, give our expert team a call!